With each new End Times book comes a new swathe of destruction cut across the Fantasy world. 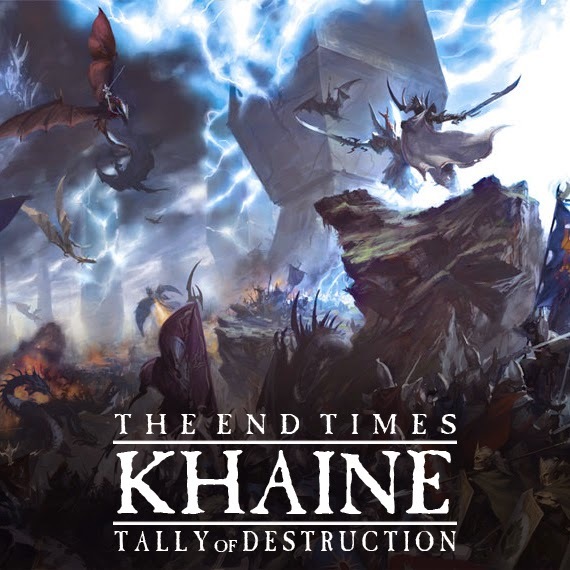 Famous and well known characters bite the dust and entire lands crumble into history and Khaine was no exception. I think this would go without saying, but SPOILERS below! The home of the Dark Elves comes under attack from Valkia the Bloody and a crazed horde of Khorne worshippers early on in the End Times. Although Valkia is temporarily slain by Malekith at one point and parts of the horde repelled, numerous cities fall to Chaos. Instead of wasting his race's strength on fighting numerous battles with Chaos and ultimately being the lord of a ruined kingdom, Malekith decides to abandon Naggoaroth. Rounding up the entirety of the Dark Elves minus a small force that stayed to defend Ghrond and Hellebron's blood crazed followers, Malekith set sail for Ulthuan. Betting the survival of his people on their ability to retake their ancestral home. Not wanting to leave the forces of Chaos anything to take they slaughtered all of their slaves and set fire to their cities. Although the land itself still stands, all of the cities and signs of civilization are nothing but ruins, now haunted by Valkia's horde. This one stung a bit. It's the equivalent of Gotrek or Felix dying (which may still happen). Darkblade was tasked with leading the main assault on the beaches of Ulthuan. While assaulting the walls, Morathi tricked him into letting the Demon bound within him free, turning him into a Greater Demon. This ultimately helped them win the battle and afterwards Morathi helped bind the demon back inside Darkblade's flesh. Later at the battle of Reaver's Mark the demon took over again while he was fighting Tyrion. To add insult to injury, his faithful Cold One Spite was crushed underneath the bulk of the demon as he transformed. While he put up quite a fight, Tyrion ultimately killed him, ending malus Darkblade's tale for good. Although there still in one more Darkblade book scheduled to come out in February. The description sounds like it will tell the tale of his invasion of Ulthuan, so who knows if he's really dead. When Chaos is involved, anything goes. Finubar, the latest in the line of the Phoenix Kings, was isolated for months in his personal chambers, with no one able to contact him. As his island nation burned Tyrion finally took charge and had Korhil chop down the door to the King's chamber. Inside they found Finubar dead, apparently for quite awhile. We later find out that Teclis let Malekith in who murdered him. Although they claim that he didn't put up a fight at all due to his guilt for faking the initiation rights of becoming the Phoenix King. 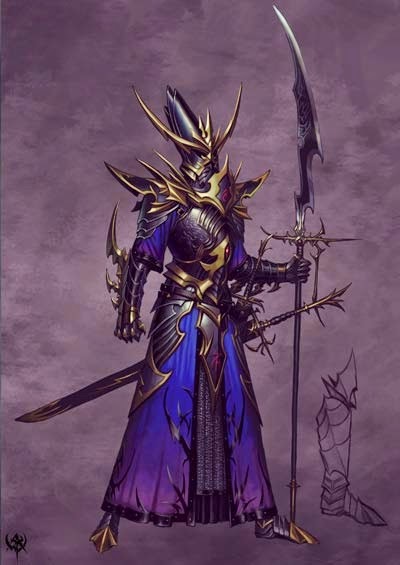 Kouran Darkhand, the captain of Malekith's Black Guard led the assault at the battle of the Blighted Isle. He slaughtered his way through the High Elf lines, even killing a prince. Eventually he met his match though in Alith Anar, the Shadow King. Facing off in a duel Kourna couldn't keep up with the king and died with a sword through the chest. 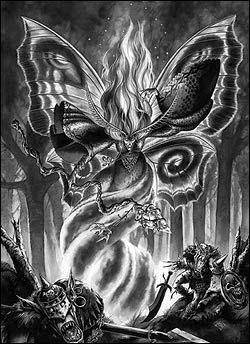 Ariel, the queen of the Wood Elves and earthly manifestation of the goddess Isha, became heavily infected by Nurgle. Alerielle the Everqueen came to Athel Loren seeking help for her daughter who was in the clutches of Mannfred. In exchange they asked her to help heal Ariel. Although she was unable to save her, when Ariel passed away a portion of her being fused with Alerielle, imbuing her with her powers. 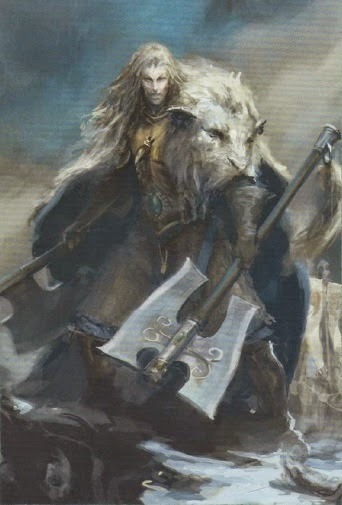 Orion was the king of Athel Loren and the manifestation of the god Kurnous. After his wife died he knew that if he went to sleep for the winter as he normally does that he would not revive come spring. Instead he choose to stay awake and lead the Wood Elves in defense of Ulthuan from the now blood crazed Tyrion. At the battle of Withelan he faced off against the prince himself. When they finally met in battle Orion grabbed Tyrion by the neck and repeatedly punched him in the torso, cracking his ribs. Striking back with the Widowmaker, Tyrion chopped off on of his horns. Gathering the last of his strength, Orion shoved his spear into the rent in Tyrion's armor caused by Imrik's lance and snapped off the tip. With one final blow, Tyrion ended the god of the wood's life, his body turning into ash. The Elven god Vaul had taken the form of a blind blacksmith named Daith in the Wood Elf forces. At the battle of Withelan he finally revealed himself to Araloth and strode into battle one last time. Taking out an entire unit of Sisters of Slaughter he was caught off guard by one of the Sisters who was faking dead at his feet. 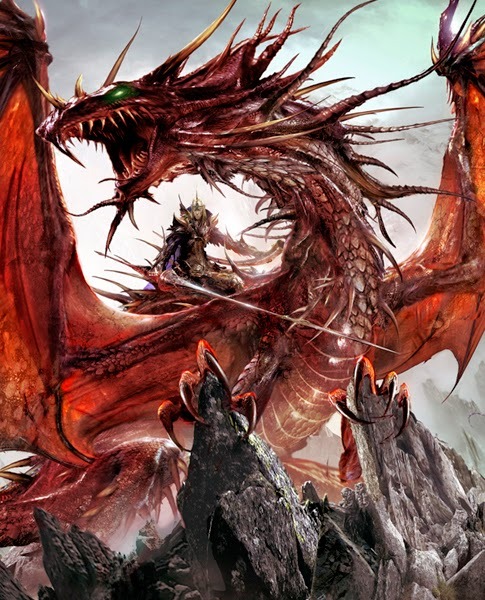 All Araloth could do was watch as the Elven god fell on the field of battle. Korhil, the captain of the White Lions, sided with Tyrion early in the conflict. Once his prince had possession of the Widowmaker and the Elves started to be poisoned by the blood lust Korhil was right along side him. Once the captain was separated from the sword he started to regain his senses and knew that as much as it pained him, he had picked the wrong side. Seeing no other option he stole the Widowmaker and set off to deliver it to Malekith. Unfortunately for him Morathi's forces caught up with him, but not before he joined up with Hellebron. During the battle though he was captured and brought back as a prisoner. Tyrion spent an entire night torturing him, leaving him crippled and without eyes. The next day he was executed by being beheaded with his own axe by the brother of a prince he killed when fighting off Morathi's forces. Once Tyrion obtained the Widowmaker the blood lust of Khaine quickly began to turn him into something much darker. At the battle of the Isle of the Dead, he assaulted Malekith's forces, hoping to claim the throne of Ulthuan once and for all. When the two met in battle before the Great Vortex Tyrion had the upper hand. Malekith was beaten into submissions, no match for the Avatar of Khaine, and finally his chest armor was breached by the Widowmaker. Bleeding and exhausted the former Witch King stood defiant before the Dragon of Cothique awaiting the final death blow. Fortunately for him it never landed as Alith Anar let loose with an arrow that pierced the crack in Tyrion's armor and stuck him in the heart. As he toppled over dying the madness that had afflicted him left. So passed the heir of Aenarion, Defender of Ulthuan, Dragon of Cothique. 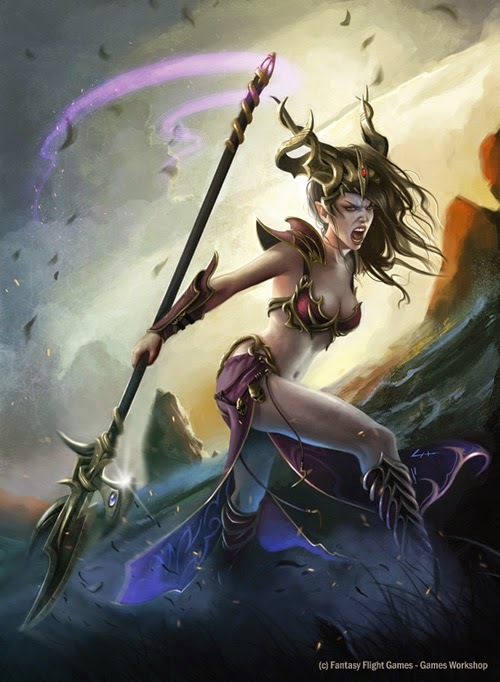 Morathi, mother of Malekith, betrayed her own son early on and sided with Tyrion. Using her magic she bewitched the Prince and bent him to her will. 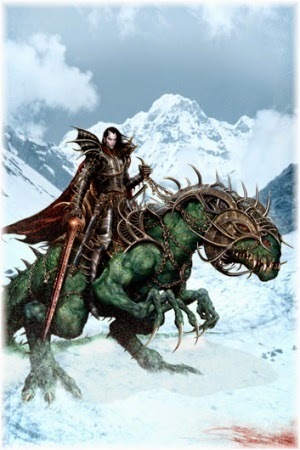 Once he came under the shadow of Khaine she no longer needed to trick him and became his lover and confidant. At the final battle after she saw her lover fall she lost control and began to attack Teclis. Determined to make all pay she dove headlong into the Vortex and killed all of Caledor Dragontamer's mages. As the winds of magic spun out of control Slaanesh began to push himself through the hole in reality. Not wanting to let her get away, Caledor held her tight as Slaanesh's massive claw gripped them both and pulled them into the Realm of Chaos. Although she is most likely dead, you never know when it comes to Chaos. 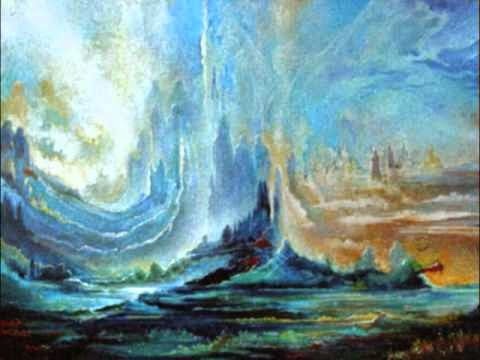 The creator of the Great Vortex was still alive all these millennia later, still inside the Vortex sustaining it, although time flowed differently for him. When Morathi attacked him and his mages he made sure to hold her tight so she couldn't escape. He faced the claws of Slaanesh with her and was dragged into the god's realm for who knows what fate. 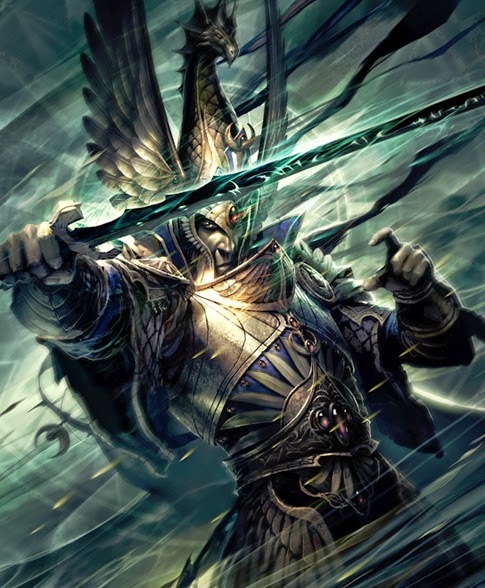 As the Vortex failed, Teclis quickly tried to finish his plan, to bind the winds of magic to mortal avatars. Many of the winds escaped, including the wind of Heavens which bound itself to someone in the Empire. Acting quickly he bound the wind of Life to Allerile. 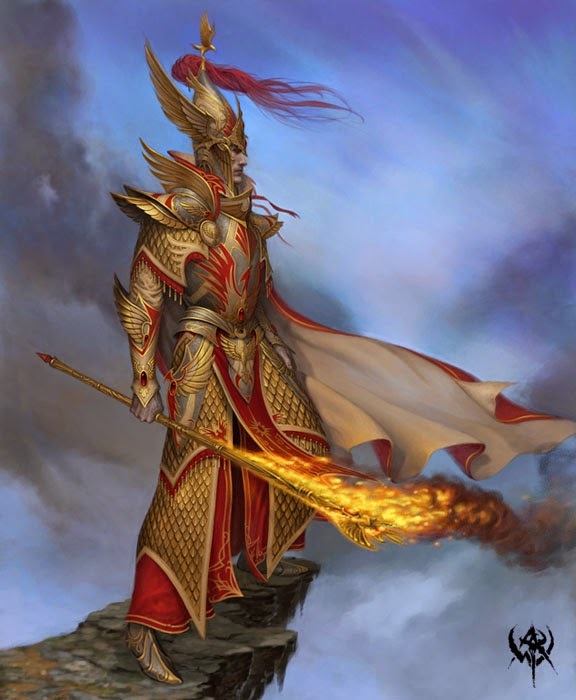 He meant to bind the wind of Fire to Malekith to cement his rule as the Phoenix King but it escaped his grasp and instead had to settle for Shadow. The last wind he bound was the wind of Light which he bound within himself. With the Vortex no longer sustaining the island it began to slip beneath the waves. The remaining Elf forces fled through the worldroots to Athel Loren. Teclis stayed though, cradling his brother's dead form in his lap. The last to leave was Imrik, who offered Teclis a seat on his dragon. Refusing the offer, the last Imrik saw of the mage was him holding Tyrion tight as the waves overtook them. 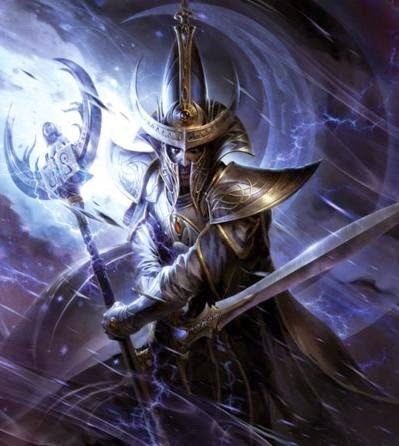 I am somewhat hesitant to believe that Teclis is actually dead since he has the power of an entire wind of magic at his disposal. Only time will tell. As the magical vortex dispersed the powers that held Ulthuan together failed. No longer sustained by magic the entire island nation began to crack apart and slip beneath the waves. Luckily for both the High and Dark Elves, the Wood Elves were there to open up paths in the worldroots, and the entirety of the Elven race fled their ancestral home. With both Naggaroth and Ulthuan gone, the vast majority of the Elves now call Athel Loren home with Malekith as their Eternity King and Allerielle as their queen. Hydras and Phoenix make the same glades their homes as Treeman and Dryads. 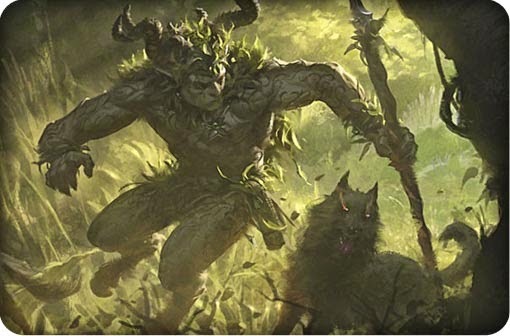 The beastman within the forest are hunted down, almost to extinction, and the poor Bretonnians now have to deal with the malicious Dark Elves raiding their lands. The future of the Elves is certainly up in the air at the moment. With the next book rumored to be focusing on the Skaven who do you think will be next to fall to the Tally?